Hi there. First post on this forum and unfortunately i need your help. The problem is that today i disconnected a hard drive from power without unmounting it. This isn't the first time so i didn't worried too much but after i connected the hdd again i can't access the partition. Gparted says that it's unallocated space and i can do nothing. So i installed testdisk scanned for partitions but nothing there. I also did a deeper scan but still nothing. When it analyses the cylinder i get these results where Downloads was the mount name for the partition. 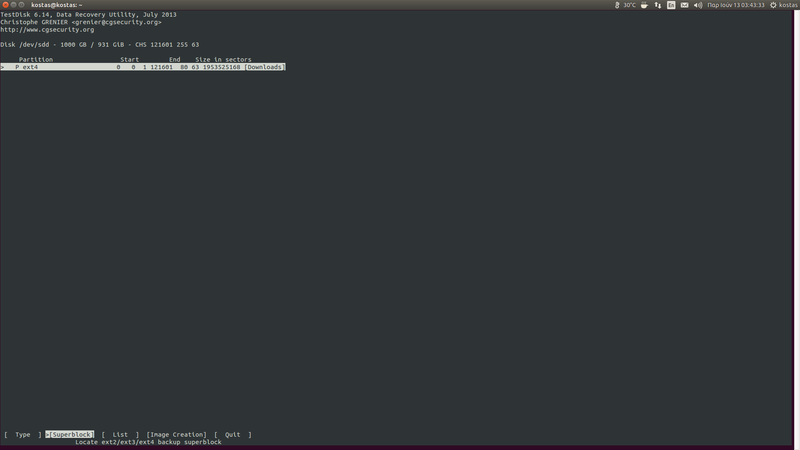 Support for this filesystem hasn't been enable during compilation. Please help me as i don't want to lose the data. Currently, there is only one small NTFS-Partition in your partition table. Your remaining diskspace appears as unallocated. TestDisk might display partitions using the backup of your superblock. You can mark them and press p to have a try to list your files. As i wrote in the first post i already did a deeper scan and this was the final result. Is there any way to recover the partition? Should i do again a deeper scan? Is it safe to run this command? Also when i choose the hdd with the lost partition it is recognizes by tesdisk by none. I have to manually set it to intel partition. Actually, under windows I don't recommend chkdsk without backup. It's a utility to have a try to repair a file system. Datarecovery is different and I prefer not to change/modify anything to a file system. But it's for me difficult to judge, because I'm not as much a Linux tech savvy. Most cases I've seen, it was possible and sometimes files were found in lost+found folder. Easily, I can't judge it! Before you can run fsck you need an appropriate and valid partition in your partition table. 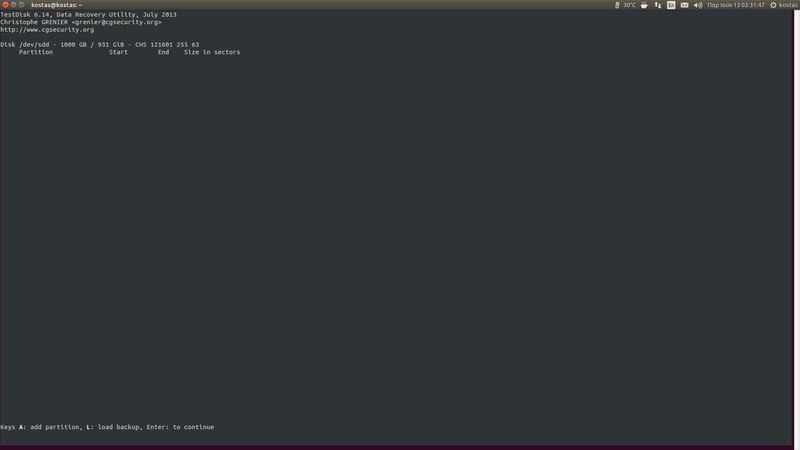 Currently there is no Ext4-partition but unallocated space only. If you use partition table type None, you can't write any partition into your partition table. That's why partition table type Intel and Deeper Search is recommended. If partitions are found, please try to list your data. I made the analyse again but still no luck. I choose intel partition and made again a deeper scan. 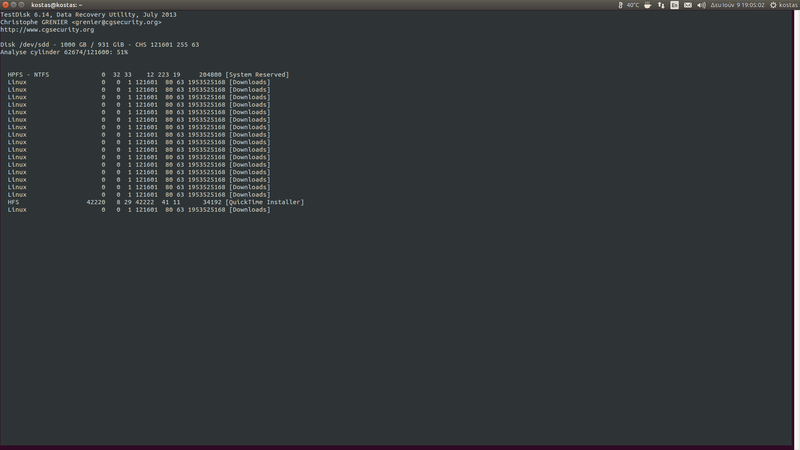 Here is the output of testdisk. Do i have to forget the data or there is still hope? There will be always hope! 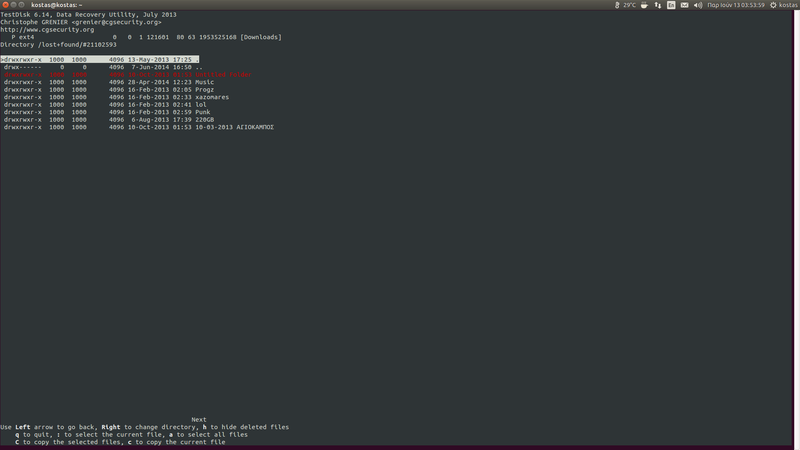 I've got all info about your Linux Linux partition. Even the label Download is still available. 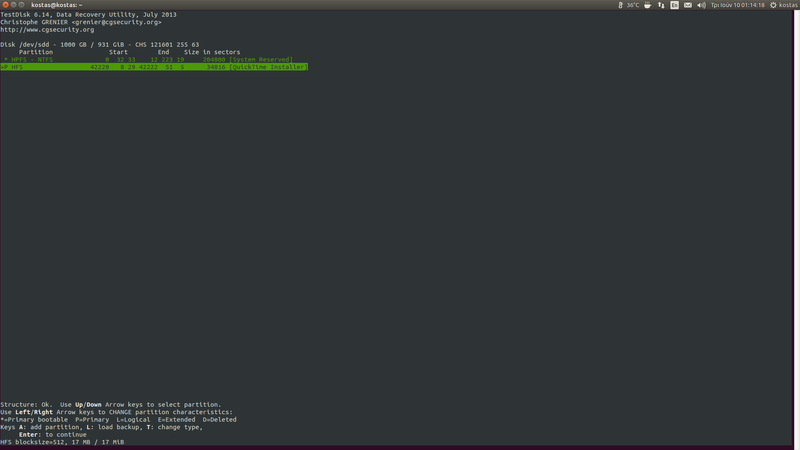 So it might be possible to add your Linux partition manually. Also it's possible to use datarecovery software reading your underlying data in your sectors. I'll be back tomorrow in the morning! The hard disk had only one partition in ext4 filesystem. Nothing else and i am absolutely sure for this. I don't know if that helps but i felt that i had to write it. I am still here waiting for your help. Your ext4-partition is not Intel-MBR standard and starts too early. There would be a possibiltiy to add your partition manually? If you run Quick Search, you can stop it and press a for add. You could enter the values as followed. Please note, if "Quick Search" already found some windows partitions you should mark and set them to D for deleted and if D doesn't appear, please set it to white color. 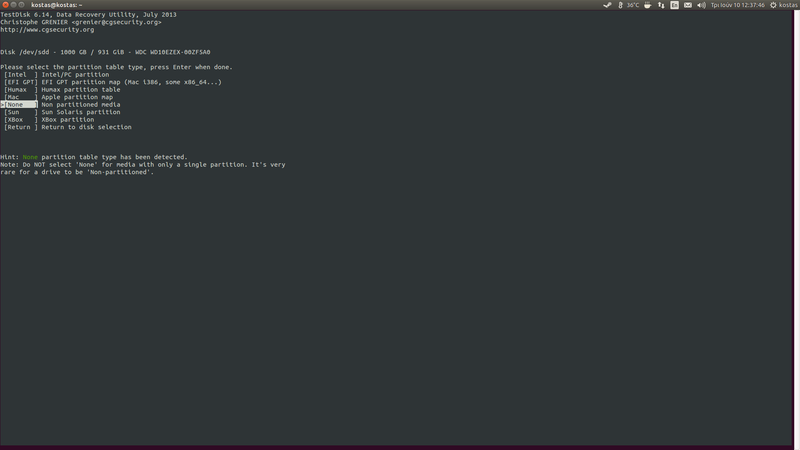 If you press enter, you can use Write to write your partition into your partition table. If you have a Linux-partition in your partition table, you can run testdisk / "Advanced / Superblock" to get the values as described in my link above to run fsck with an appropriate value of a backup of your superblock. Adding a partition into your partition table, doesn't touch any (underlying) data within your partition. It'll be written into your partition table and MBR. 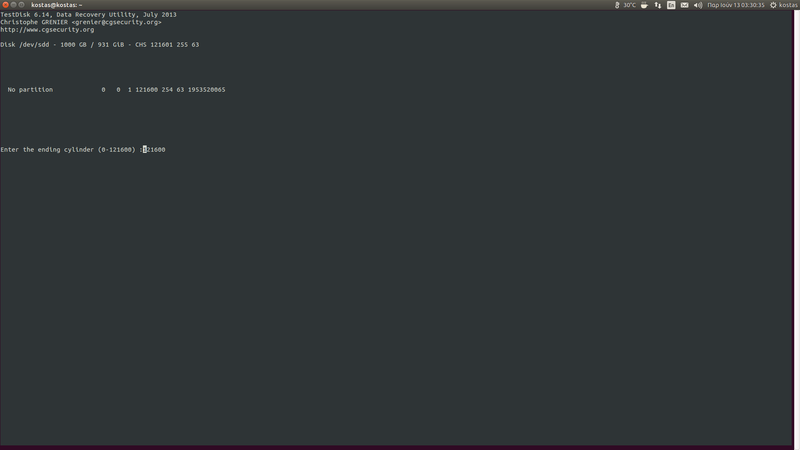 The MBR is only 512 bytes and it's the first executable sector of a disk. I have pressed a to add a partition, then entered the values you provided except the cylinders value. It allows only 121600 as maximum value as you can see in the picture. I pressed enter and the partition is not added. This is the next screen that i see. Also i don't see any write option. Did i did anything wrong? I can also list files so the hope returned for now. What do i have to do now to recover successfully the partition? Since Vista, Microsoft partitions are aligned to megabyte boundaries. Intel partitions are aligned to cylinder boundaries. In the menu Options, you can try to set "Align partitions" from Yes to No and retry to add your partition again. Currently, if you are able to list your files, you can copy them to another healthy disk, partition and folder. Standard folder is your testdisk folder. If you'd like to use another disk partitoion or folder, you can check that two dots in the upper area of your screen and press enter. Each time, you'll get one directory up until you get to your disk selection. You can select another healthy disk or partition. You can check a folder and use the right arrow key on your keyboard to enter a folder as a destination, where you'd like to recover your files to. Copying files is recommended, because your partition is not standard. At the bottom of the screen, you'll find all the commands. After backing up your data you can create a new partition and copy your files back. Red listed files are shortly deleted ones. If you don't need them you can press h for hide.